Check out the blueprints hidden Warden Quincy Sharp's secret room in the hit Arkham Asylum game. 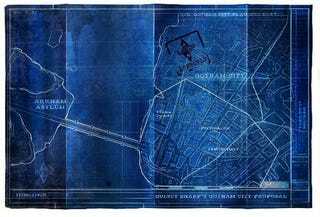 Are these the plans for the new video game Arkham City? And how come nobody knew this secret room even existed? We've been drooling over the hidden gems in Batman: Arkham Asylum for some time now. But thanks to Gameinformer, we've found yet another gamer Easter Egg. Check out their how-to video that explains how to find the Warden's secret room filled with blueprints and Arkham City concept art. Arkham City has an even better look at the plans, which we included up top. Who's ready for the Arkham City game now?